Just a few weeks after France launched an intervention aimed at rooting out Islamist Ansar Dine rebels in northern Mali, French and Malian forces retook the historic desert city without resistance and to the cheers of local citizens. However, the city’s ten months under Islamic rule still had consequences, not just for the people living there but also for the historical treasures the city in known for. Reports of the destruction of Timbuktu’s Sufi tombs, shrines and mausoleums started last May as Ansar Dine viewed the monuments as undermining their strict interpretation of Islam. International outrage ensued; UNESCO demanded the destruction stop and created an emergency fund to pay for restorations while the Chief Prosecutor of the ICC Fatou Bensouda called the destruction a war crime and opened a preliminary investigation into the Malian conflict just a few days later. Even as the world watched the situation with growing concern, there was hope that Timbuktu’s famous libraries would be spared. Now it appears the libraries housing thousands of ancient manuscripts from the Golden Age of Islam may not have fully survived. Early reports yesterday from the Mayor of Timbuktu, who fled the city last month, stated that Ansar Dine burned down the Ahmed Baba Institute, the primary central repository for manuscripts, before leaving the city. Once international journalists made it into the city, these reports were refuted, but a report from Sky News’s Alex Crawford at Ahmed Baba showed a room filled with empty boxes that used to house manuscripts along with evidence that some had been burned. Yet the question remains, how many? Most of Timbuktu’s manuscripts are in private libraries around the city rather than Ahmed Baba; estimates of how many manuscripts were actually stored at the internationally funded institute range from 10,000 to 40,000. However when Ansar Dine started to approach the city last year, efforts to smuggle out and hide the manuscripts started for fear the rebels would destroy them; these efforts stopped once Ansar Dine took control of the city in April and stationed themselves inside Ahmed Baba’s air conditioned walls. Likewise, researchers began digitizing the manuscripts years ago, but technical delays stalled progress until the war shut it down completely. Hopefully the picture will become clearer in the coming days but for now people can only speculate on the damage done and wait to see if any of the manuscripts appear on the international black market. In the meantime, the destruction of the cultural heritage of Timbuktu raises questions of what is, or maybe should be, an international crime. Timbuktu’s manuscripts date back centuries to the time when the city sat on established trade routes and was an important center for Islamic learning. Although its status fell following French colonization, the unique manuscripts provide a glimpse not just of Mali over the centuries, but of Sufism and the spread of Islam in Africa. They represent a key to an important part of human history and given their nature, are irreplaceable. Thus, the intentional destruction of such artifacts would seem to epitomize the concept of a crime against humanity. Yet modern courts have been slow to make a case for just that. While the destruction of religious artifacts and cultural property can be signs of crimes such as genocide and persecution as a crime against humanity, the destruction itself is typically not treated as a standalone crime under international law; after all in a court prosecuting only the most egregious crimes, people should matter more than things. As Jadranka Petrovic points out while looking at the destruction of Mostar’s Stari Most bridge during the Bosnian War, this arrangement protects cultural property indirectly by connecting it to the community of people being attacked. In the framework of cultural property and not religious property, the connection to prosecutable international crimes becomes even less clear as it becomes harder to define the connection between culture and civilian community. But there are reasons to believe this could change with Mali perhaps being the first case before an international court to do so. Following the widespread destruction of cultural property in World War II, the international community created the 1954 Convention for the Protection of Cultural Property with an additional protocol added in 1999 that established individual criminal liability for certain acts and called on states to enact domestic legislation criminalizing intentional or wanton military destruction of cultural property. Furthermore, Protocol I of the 1949 Hague Conventions added the protection of cultural property to international humanitarian law in 1977. These conventions predate the ICC but provide an established legal framework for prosecution under international humanitarian law. There is also room within the ICC’s Rome Statute. Although the statute’s definition of the three major crimes – genocide, crimes against humanity and war crimes – focus on the loss of life and deprivation of civil and political rights, Article 8 does define extensive and unjustified destruction of property as a war crime and lists the targeting of historic monuments and buildings dedicated to education, art and religion as a possible war crime under international law. There is no doubt that Ansar Dine’s destruction of Sufi monuments and possibly the city’s historic manuscripts falls directly into these definitions. 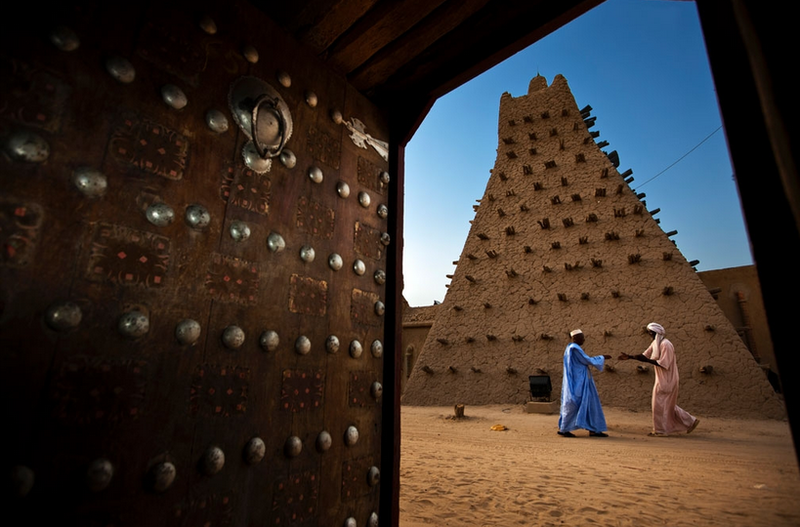 Many of the residents of Timbuktu still worship at the shrines as part of their religious beliefs and the cultural property of the city is significant not just for northern Mali, but for West Africa as a whole. At no point has the destruction been militarily necessary and it was entirely avoidable; the reason for it was simply to wipe out any and all cultural traditions that contradicted with Ansar Dine’s narrow world view. It follows in the unfortunate tradition of other extremist groups such as the Nazis with Jewish synagogues, the Khmer Rouge with the widespread vandalism of Angkor Wat and the Taliban with the destruction of the Buddhas of Bamiyan. The fact that previous international courts failed to give adequate attention to the destruction of cultural property as a standalone crime even while recognizing its importance in some decisions should not prevent the ICC from attempting to prosecute these crimes if indictments are issued in the Malian conflict. Outrage always follows these incidents but punishment rarely does. In the end, people still matter more than things and there are plenty of crimes against people the ICC can indict on if it chooses, which it probably will. But in cases of cultural heritage, it is not just the local community but the whole world that suffers from its loss. That deserves punishment too.